From a large unit repair to a complete system replacement, if your HVAC unit’s wellbeing takes a dive, your budget will, too. This will lead you on a wild goose chase to find a way to pay for your comfort to be restored—but, thankfully, not anymore. When you upgrade to high-efficiency HVAC and water heating equipment, you could receive up to $1,800 in rebates through SAVEGREEN. Or, finance up to $14,000 at 0% APR for five years and apply for a WARMAdvantage $700 rebate or COOLAdvantage $500 rebate with NJNG’s on-bill repayment program (OBRP). 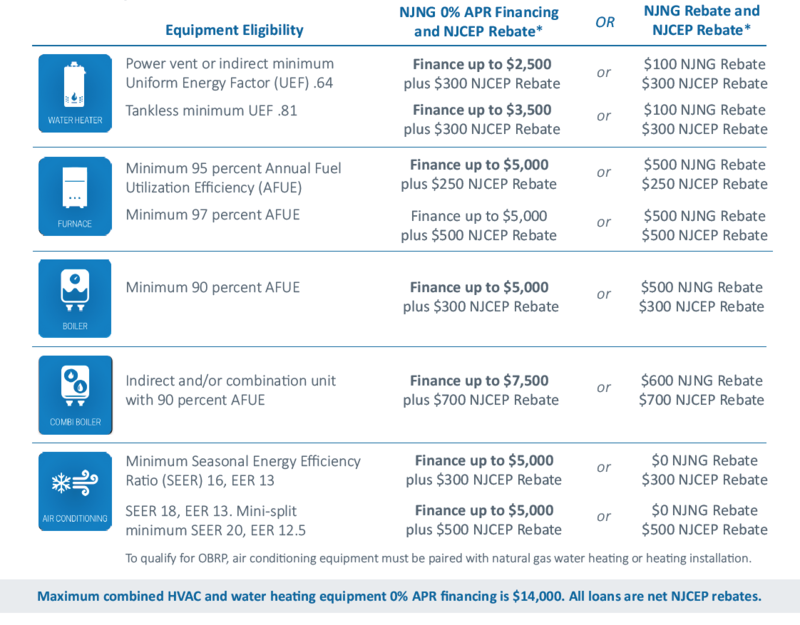 Here’s how: Check out the equipment eligibility requirements below, and if your comfort system fits the bill, complete and submit this application. There is no risk and no obligation to buy. Furnace with a minimum 95 percent Fuel Utilization Efficiency (AFUE). Water boiler with a minimum 90 percent AFUE. Water boiler with indirect and/or combination unit with 90 percent AFUE. Air conditioning with a minimum Seasonal Energy Efficiency Ratio (SEER) of 16 and an EER of 13 system efficiency, mini-split with a minimum SEER 20, EER 12.5 system efficiency. Water heater with a minimum Uniform Energy Factor (UEF) of .64 and power vented. Tankless water heater with a minimum Uniform Energy Factor (UEF) of .81. At Swanton Energy Services, we designed a financing plan that will keep your comfort—and your budget—soaring toward serenity. With our special financing terms, you can migrate away from paying for an expensive HVAC service in full and, instead, pay for it through smaller monthly payments. This new way to pay makes attaining and maintaining total comfort an effortless flight. Program details and incentives are subject to change. Commitments are not to exceed budget. The funding will be available until June 30, 2018, or until the funds are fully exhausted, whichever comes first. As they say, birds of a feather flock together. Because of this, we make it easy to both apply for instant financing and make a payment through our all-in-one financing tool.